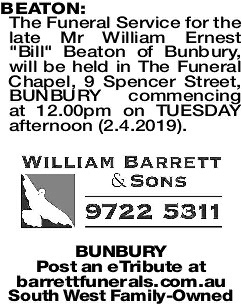 The Funeral Service for the late Mr William Ernest "Bill" Beaton of Bunbury, will be held in The Funeral Chapel, 9 Spencer Street, BUNBURY commencing at 12.00pm on TUESDAY afternoon (2.4.2019). 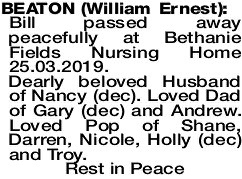 Bill passed away peacefully at Bethanie Fields Nursing Home 25.03.2019. Dearly beloved Husband of Nancy (dec). Loved Dad of Gary (dec) and Andrew. Loved Pop of Shane, Darren, Nicole, Holly (dec) and Troy. 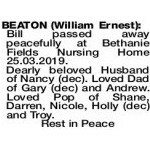 BEATON BILL Loved brother of Stan. Many years of good times. You can rest now Bill. 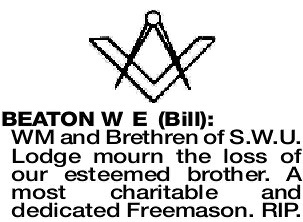 WM and Brethren of S.W.U. Lodge mourn the loss of our esteemed brother. A most charitable and dedicated Freemason. RIP.